Sometimes we find something online on our PC that we want to get onto our mobile device.This is not a problem for small URL links, but most of the URL links are quite long and typing them manually is not an easy task. 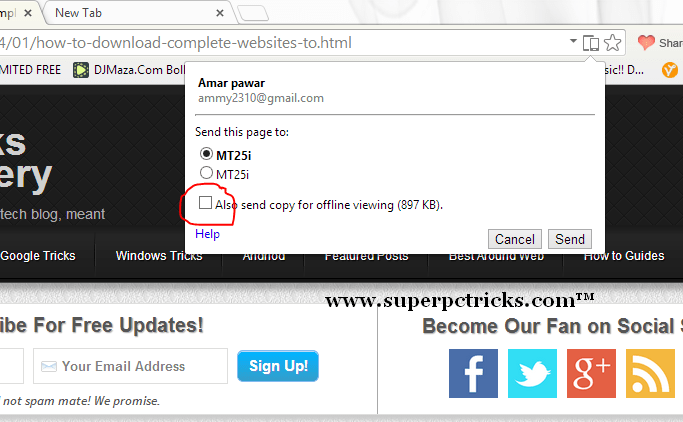 One workaround for this is email yourself and then open that email in your mobile device.This also appears quite tedious process.The alternative to this is to use Chrome to Mobile extension which enable you to send webpage links from your PC to mobile device running mobile version of Google chrome. You are going to need Chrome browser for this .So if you do not have chrome installed on your PC, you can install it by going here. In chrome on your PC ,sign into your Google account and go to Chrome web store.Search for Chrome to Mobile and click the Add button to add the extension to your browser. Whether you are running Android or iOS, download the latest Chrome app ,run it and sign into the same Google account you are currently signed into on your PC. Open Chrome in your PC and open the webpage that you want to send to your mobile.To the right of web address window is a small mobile logo symbol.This is Mobile to Chrome extension .Click it and select connect to your mobile device.Only devices which are running chrome, signed into your Google account and are online will be shown in this list. Select your device from the list and select Send. A notification will come up on your device showing that a webpage is ready for you to view.Click it and your link will be open in your device browser. If you also check the box Also send copy for offline viewing , once the page loaded on your mobile device ,click view offline copy .This will open the offline version of the page so that you can view it even when you are offline on your mobile device.However selecting the check box will also increase the data sent to your mobile device and hence it will take some time.